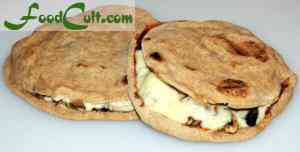 Pizzita - the Pizza Sandwich in a Pita Bread! Let's go make this fantastic pizzita - the pizza sandwich on pita! Slice most of the top from the pita - leaving it hanging on as shown. Add your base layer - one shown here, with tomato sauce - the other with slices of tomato. The sandwich on the left is prepared with tomato slices, a bit of basil and oregano, brocolli and orange bell pepper, mushrooms, mixed cheese and black olives. The sandwich on the right is prepared with a pizza sauce, sliced sausage, orange bell pepper, mushrooms, mixed cheeses and black olives. Pizza is just bread with stuff. Top it the way you like it - enjoy your sandwich. Don't over-bake it (don't let the pita get too crusty or it won't be fun to eat). This is just one of the easiest things to make! You can use commercially prepared pitas or you can make your own. We prefer home-made pita but your favourite will work! First and foremost, this is a sandwich. What makes it a pizza sandwich is what you put in it. Ours almost always has some mozzarella and some grated cheeses (parmesian and/or romano). A variety of cheeses in your sandwich will embolden the flavours! Top it the way you like it - it's your pizza ... umm ... sandwich ... umm ... pizza sandwich ... umm ... Pizzita!